Back in July, when Cleveland was still mourning the betrayal of LeBron James, Matthew Bellamy wore a LeBron Miami Heat Jersey to a Cleveland Indians game. His clothing decision caused quite a stir and was kicked out of the game. Now, the Heat have invited Bellamy to go down to Miami and attend a Heat game and meet the team. yeah, its a night named after me get to meet the team, all xpenses are paid for!! Cant wait super excited. Maybe he can hang out with Kanye West after the game? A fan at last night’s Cleveland Indians Detroit Tigers game caught a foul ball while holding a baby. What will probably get him in trouble with from his wife, it was great for the SportsCenter highlights. The Indians beat the Tigers 4-0, although the game didn’t mean much to either team, who are 13 and 25 games back respectively. Still, it’ll make a great story for when the kid is older at how his dad sacrificed his life for a foul ball. 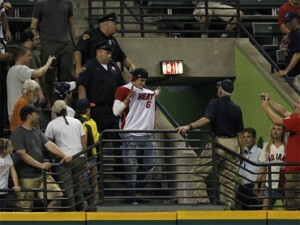 A fan in a LeBron Miami Heat jersey was escorted out of the Cleveland Indians game last night. The Indians played the New York Yankees, and Alex Rodriquez attempted to get his 600th home run. However, A-Rod was over shadowed by the LeBron fan who at in the left-field bleachers as fans chanted obscenities at him. The fan was later escorted out for his safety and A-Rod failed to reach 600.